As you can see there are various types of blades being sold in stores that you can use to make your life and cooking easier. But you might be looking for that one blade that can solve all of your problems, are you really? Sorry to disappoint you but there is no one kitchen knife that can fit all your needs while cooking a meal with varying ingredients from beef to fish meat and vegetables to fruits. However, a chef’s knife can become a substitute for most of the other kitchen blades, so it’s best that you know how to test and buy a chef knife for your daily use. If you think you can perform the above mentioned task effortlessly, then it means you are ready to take that one blade home or the whole chef and kitchen knife set, in case you were weighing all your options. In order to buy any blade, you should know first know about its various parts along with the materials, or ways, using which it is manufactured. So, let’s go on a journey from the tips of the kitchen knives for sale available in stores to the butts of their handles. No matter where you are living in the world, a great chef’s knife should come sharp straight out of its box. To judge the sharpness of the blade you can perform the task mentioned before but if not possible cutting a piece of paper can also work for you, as a good chef knife must allow to cut it swiftly and cleanly. Also, a fine gentle curve along the heel to the tip can really help in dicing and mincing as it allows you to make rock back and forth movements smoothly. Mostly referred to as the spine of a blade, the top portion should be nicely polished instead of being rough and/or sharp, this can prove to be devastating to use later on. So, it’s best to feel it out and know whether this important kitchen knife has a nice spine and a thin tip. This part makes the blade good enough to cut and chop through thick ingredients like squashes and the tendons and meaty parts of poultry animals. How it becomes possible? Because the heel is the thickest and broadest part of these highly used cooking knives, reinforced for one reason and one reason only— to cut through most ingredients. A thick part between the blade and the handle that gives stability to the chefs knives, is known as the bolster. It also gives your hand, especially fingers, a good amount of safety against these sharp kitchen knives. As important as the blade, the handle of a cutlery knife must feel right while you grip it in your hands. Neither it should slip when it get wets nor should it hurt your hands even after a long time of dicing and mincing. Also, the handle needs to be placed at a certain height from the outer edge otherwise you might hit your knuckles as you chop through fresh green onions and ruining everything for you. Some handles have indentations for a better grip, but it can prove unresourceful when carving up thick skinned fruits or vegetables. How Various Kitchen Knives Are Manufactured? In this technique, a red hot billet of steel is hammered into a shaped die. 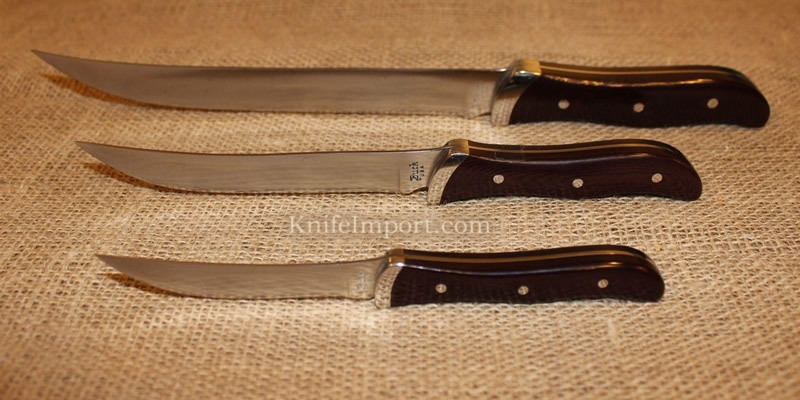 The forged chef knives are well known for their balance and durability. However, these blades need to be maintained with constant sharpening and cleaning. Such stamped kitchen knives are cut out of sheets of top quality steel using a laser. Yet another type of kitchen blades, the ceramic knives, are also made in this manner using lasers to cut ceramics and producing these blades as an end result. What are Ceramic Knives that We Keep Talking About? Basically, a tough ceramic is used to made these blades in varying forms and sizes— santoku, chef knife and any other kitchen blade, you name it. As their edges stay sharper for a long period time in comparison to steel blades, ceramic knives are gaining popularity for filleting salmon, carving steak, slicing ripe and fresh tomatoes, even chopping up vegetables better than you can think possible. In the end, we hope this blog is extremely informational for you and will help you purchase the perfect cooking knives for your kitchen.